As in previous years, Albany Kart Track proved tough on drivers and machine! Once again rain added to the tough weekend and we now have a big fight on our hands for the final round at Wundowie on the 9th September. Qualifying was in wet and tricky conditions. Alex Barboutis keeps adding to his excellent rookie season taking Pole position from another rookie in Tyler Nastasi and last years Rookie of the year winner Mitchell Perrella. Race 1 was also in the wet. Barboutis got out front and held on to win. Nastasi followed him home to take 2nd. Perrella eventually succumbed to current Championship leader Daniel Currey to come home 4th. Race 2 was on a ‘drying track’ however most stuck with the wets. Barboutis dominated once again having the race on his terms and taking the win. Nastasi was unable to keep 2nd spot this time around and Hayden Patrizi got an amazing start and first couple of laps to make his way into 2nd. Currey was unable to finish which made way for Perrella to get up to 3rd. Pre-final, Baboutis once again got the dream run from the start and headed out the front. On lap 5 however, Nastasi made the move to take the lead and drove away for the all import front row start for the final. Baboutis the fell back to Perrella who also found a way past. Perrella eventually locking in the front row to finish 2nd Barboutis 3rd. The final, as usual with the WA KZ Series, was action packed. Jake Klarich, who was otherwise having a weekend to forget, showed why he is one of the best drivers in Australia, coming from 5th with an amazing start to be in 2nd place by the 1st lap! Perrella found himself leading the pack for the 1st lap only to be taken by Klarich on Lap 2. Klarich never looked back and went on to claim his 10th WA KZ Series win. Perrella was then unable to hold out Currey who also had an amazing start from 6th. Currey made sure he left the track with another bag full of points to go towards the championship finishing 2nd. Perrella held down 3rd spot until lap 13 when he stopped. Nastasi made the most of the situation moving up to 3rd place from 6th in one lap! Nastasi held out Josh Merritt to finish on the podium for the first time. Merritt 4th and Patrizi 5th. The championship is still alive and there for the taking with the top 6 having a mathematical chance of taking the title. Currey holds a great lead and as long as things go to plan he should do well. Baboutis is looking to continue his solid form and challenge for the title but needs to finish all the races. Patrizi is also in with a big chance if he pulls out some good form. In the pre final, I was off 2nd again. I got off to an awesome start holding down second but I was right on the back of first and a good move on lap 5 saw me go into the first position, I had 10 laps to take advantage of the lead and hopefully hold it! I finished first with a 3/4 of a straight length lead which was awesome! This was also my first ever race win in KZ! “Qualifying went really well in tricky conditions. I have never driven a KZ in the wet, I was worried before hand but I managed to put it on Pole. I got a good start for race one and pulled a bit of a gap and was able to manage it for the rest of the race. Race two I got another good start and pulled a gap to the driver in second. Mid way through the race, the driver behind me started catching me so I put my head down and pushed making a larger gap. Another good start in the Pre Final, finally in the dry and held 1st until lap 5 where Tyler got past me. A few laps later I braked a bit late and Mitch just got past me and I didn’t have the speed to fight back. “First time Qualifying a KZ and it was on wets. Took it easy and managed to keep on the track. Qualie time was close to the mid pack guys considering I was on used wets and they were all on new. Race one I managed to get it off the line in my first standing start so was stoked with that. Kept up with the back of the pack for the first few laps but fatigued towards the end and lost a fair bit of ground but was just happy to finish in very tough conditions. Race two we lost a wheel in the warm up lap so had to watch this from the side of the track. The Pre Final pretty much the same has heat one, kept up with the pack for about 5 or so laps until fatigue set in again, then just tried to look after the tyres for the final. *Michael is a little sore but otherwise doing well. “In Qualifying, drama struck us with a sticking thermostat in the 3 lap warm up, meaning I pulled into the pits and didn’t get to set a lap time. In race one I finished in 5th place. It was a very wet race and we didn’t quite have the perfect setup in the kart, managed to just hold on until the end of the race! Race two was better, making my way up to 4th position. 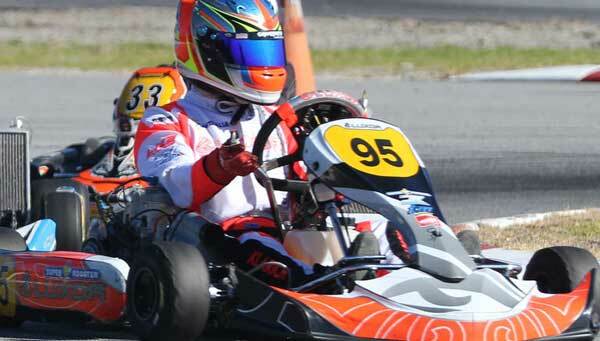 The kart was a lot more ‘racey’ and I had a few good battles throughout the race! A transponder issue meant I didn’t receive any points for that race. In the pre-final I had a good start and got to 6th almost straight away. I basically sat there the whole race, made one more spot in the last few laps before I had a last lap battle with Patrizi for 4th but didn’t quite make it happen. The kart was feeling good for the final.